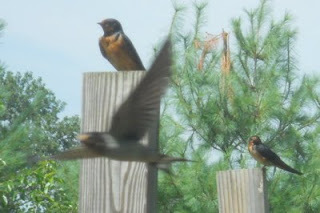 Recently the barn swallows celebrated another Fledge Day. 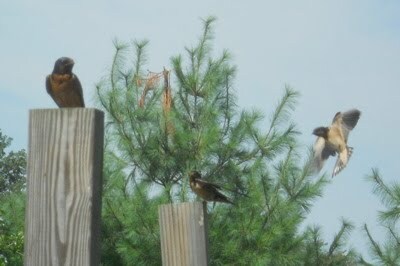 As I observe these days, suddenly as if out of nowhere, eight or ten adult barn swallows converge on the yard, swooping and hollering. The young'uns, who have practiced perching and just a bit of gliding, make it outside to watch. But as the grown-ups demonstrate what fun flying is (and it must be, mustn't it? ), the young'uns are gradually overcome with desire to leap into the air and let their wings do their thing. Then all eight or ten adults fly into formation around the young'uns, giving them the freedom to get the hang of it without worrying about hawks or flying into trees or the side of the barn. It's a magnificent ritual for a sunny summer day. And by nightfall, all the swallows will have left the barn. I do not know where they live once they have fledged. But they come back every evening to swoop and eat bugs. And maybe, just maybe, the little ones tell the others "that's where I grew up!" On another front, I've been observing the local hummingbirds through my living room window. For about a month there seemed to be just one, but about a week ago I realized three were vying for position. None has a ruby throat -- perhaps they're all young. The most interesting behavior I've seen is that one of them will perch in the vine growing up the shepherd's hook. See it there towards the top? 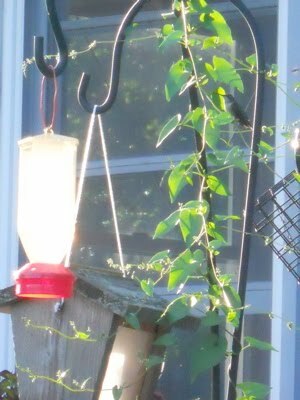 Then when another comes to drink at the feeder, the hidden one bursts out and chases it. I've read that hummers are very territorial, so this may well be aggressive behavior, but it appears quite playful. Of course they fly so fast, I was not able to catch their race in any of my photos. But they are so involved in this competition that I can sit in a lawn chair not ten feet away and watch the action. At times all three of them race back and forth, zooming over the roof or around the corner. Then number one returns to its hiding place, and eventually the game begins again. Very cool. Thanks for sharing, Johanna. 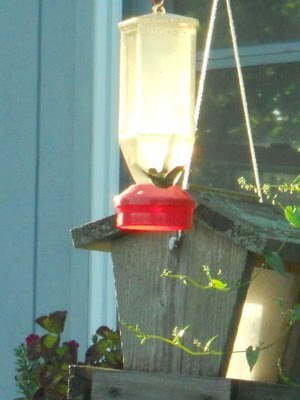 I have a have a hummingbird feeder outside our kitchen window. But I don't take the time to watch for them. I know they visit. The red sugary stuff is gone in a flash. I've seen them once or twice. But hey....maybe I need to take time to stop and watch the birdies. Oh, Randy, don't use the red stuff! 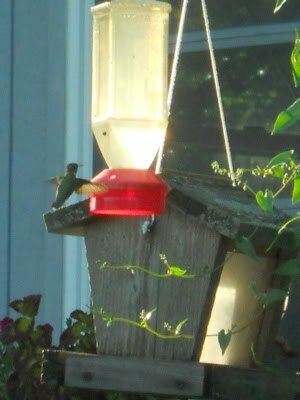 The dye is said to be harmful to the hummers. Just make "simple syrup" -- 3-4 cups water with one cup of sugar, boiled until it's clear. And yes, you need to stop once in a while and watch!